Vivian Zou, 5, speaks Mandarin and English. She learned English from watching television. 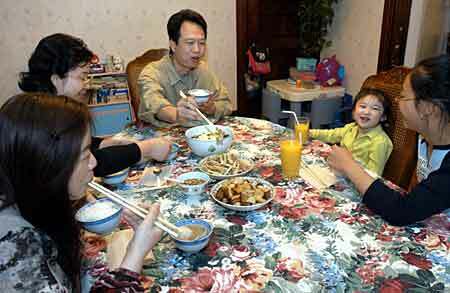 David and Shelly Zou of North Quincy with daughters Vivian, 5, and Jessica, 12, right, and family friend Patricia Han of Brighton, left, eat dinner with chopsticks. The family likes to stay connected to their Chinese heritage. 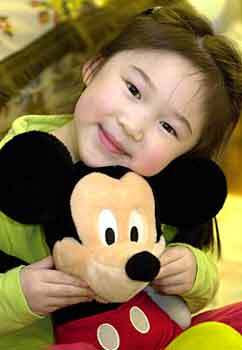 Five-year-old Vivian Zou runs around the living room of her family’s North Quincy home, pausing to glance at the television and then disappearing into another room to retrieve a Mickey Mouse doll. Her 12-year-old sister, Jessica, watches from a perch on the couch as her parents stand nearby. The Zous are representative of many Asian-Americans in Quincy: connected to their heritage but accustomed to American life. Perhaps nothing illustrates this better than the parents’ names. Yi and Cheqing Zou have adopted American names, instead going by David and Shelly, respectively. At home the family speaks Mandarin; at school or work, English. “We didn’t teach her English,” David Zou says of his younger daughter. “She picked it up from TV and her older sister. Jessica Zou, 12, watches her sister Vivian, 5, dance in the living room of their home in North Quincy. Zou, now 41 and a Quincy resident for two decades, came to America from his home in China’s Fujian province at age 19. At the time, he didn’t speak English. He attended high school and eventually earned a degree from Wentworth Institute of Technology, all the while working in Chinese restaurants to pay tuition. It was at Wentworth that Zou met Shelly, originally from Shanghai. They have been married 14 years. David Zou works in electronics engineering at Wentworth. Shelly Zou is a marketing assistant for a Boston electronics company. Firmly at home in Quincy, David Zou is now reaching out to other newcomers. He has been a member of the city’s civil rights commission for five years and is a board member of Quincy Asian Resources Inc., a relatively new nonprofit group.